First of all, thank you, to everyone for the blogoversary wishes. You make me blush. I truly appreciate your kind words. You're the best! Now onto the post at hand. Does this picture not make you just drool? I don't know how I got to this blog but I had an immediate split personality when I landed there. First, pure delight at the beauty of it. Second, pure green eyed envy at the fact it wasn't mine. I will freely admit that I don't have much room to grumble. I am fortunate enough to live in a 3 bedroom house with a sewing room versus the 4 bedroom house we bought. That was not always true. For years my sewing room was the end of the dining room, the corner of the bedroom, a corner of the family room or a portion of the basement. Now I have a dedicated sewing room. I realize that I am fortunate. I would have to admit that I am also very selfish with it. When we first moved into this house 10 years ago, I squished all three girls into one bedroom so I could have a sewing room. In my defense, that was about 12 weeks before oldest child was leaving home again. And I did take the smallest bedroom available at the time. I mean, geez louise! I have always said that I must not have passed "classification" in first grade. I am the chick who always ends up with several drawers for "miscellaneous" because I don't know what to do with one of something, or three apparently non-related items. This room is so stinkin' organized. 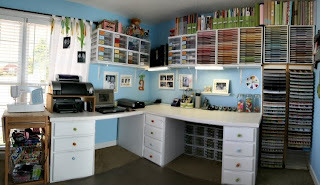 Scrapbookers I think are inherently well organized. I my defense, it is much easier to organize flat paper than folded fabric, but still. 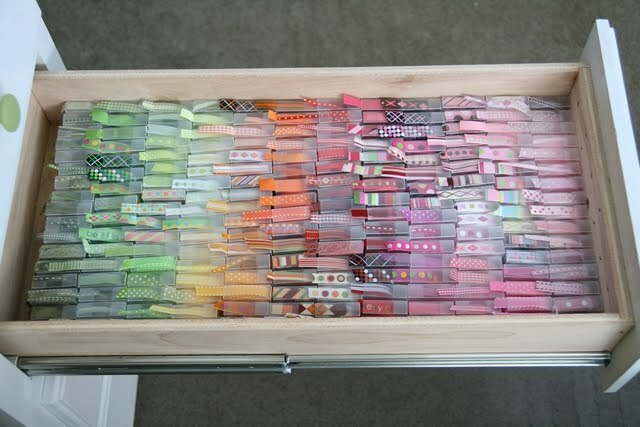 Check out this ribbon drawer! It looks like a rainbow. And why has Ikea not come to my town? Is a population of over 1.5 million not enough? Surely you can trap enough people inside your store when there are 1.5 million to choose from. My son is sure that part of their retail success is based on the fact that once you are in the store, you are trapped. For. Hours. That is his story. I have never been to Ikea, so I know not of what he speaks. For sure I am NOT sharing my sewing room with a washer and dryer! Gives me nightmares to think about it. In the first 25 years I was married I WORE out 4 washers from all the stinkin' laundry. I am sure not sharing my personal paradise with a damn washing machine. The warmth of the dryer in the winter would be a nice touch. This could be dangerous. In spades. Put a kitchen in there and I may never come out. Ever. As long as those grocery delivery services still run. 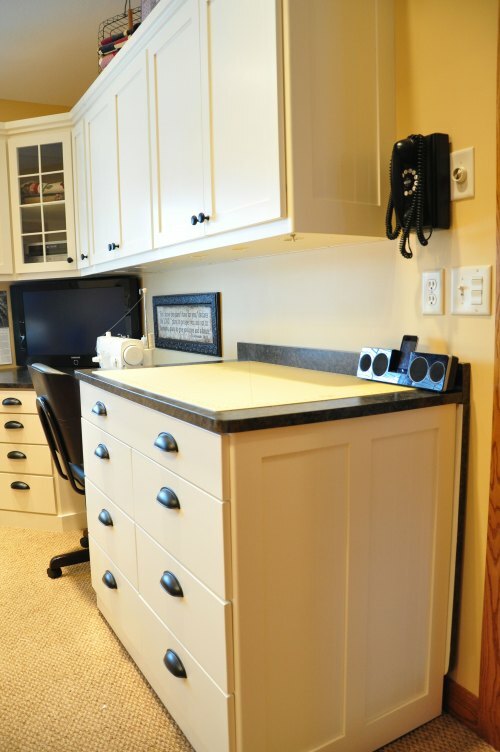 What is most important in a sewing room for you? I LUV how my dh modeled my sewing room. If you get a chance drop by. My most important requirement is good lighting!!! these old eyes aren't what they used to be!!! I am the proud owner of a second sewing machine. The fact that it has no manual, and I don't know how to run it is irrelevant. You see, it's in a case, so hopefully I can stand it up and LEAVE IT. Right now my machinse has to back in it's canvas case, so that we can eat on the table. Then again, it's always ready to take to a friends house. Our two boys who share a room are in highschool, and I have PLANS. This post was so much fun that I read most of it to my Hubby! The most important thing in a sewing room? Me!! I don't seem to make it past the threshold much these days. Have everything packed up and sitting by the door so when she leave that very day you can claim squatters rights. Just get the stuff in there, then map out later what you want to do with it. Like Jan I really need to see myself in my sewing room. Mine is slowly ... ever so slowly, coming together. Now to get my uber organized sister in law to visit to tell me where to put those things that are in the MISC drawer. I noticed someone on the last post mentioned Nanimo bars... did you tell her how you love them? I finally overtook a room in my house for a sewing room. It is a small room adjoining the master bedroom and was previously a 'dressing room'. All it had in it was a closet, wing back chair and dresser. And it was the messiest room in the house. So, I cleaned it up, moved an L-shaped cherry desk unit in there and slapped my sewing machine on it and declared the room MINE! Life. Is. Good. OK, I'm drooling here. That first room is awesome! I love my sewing room. My only complaint is I wish I had room for a tall cutting table. I don't have a sewing room, because we have 5 children, so they are all taken! However, I have a nice big kitchen with a great desk which houses my sewing stuff and there are 2 advantages to sewing this way: 1. I can sew whenever I have a few minutes and still watch the kids, and 2. I have to keep it somewhat cleaned up, since it is our living space. Someday it would be great to have an organized room like you showed! Nice sewing room pics...I don't want to share my sewing room with a washer/dryer either. 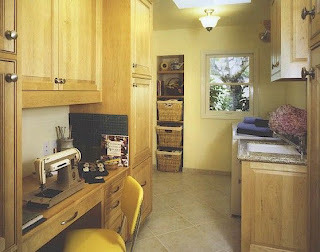 I like my sewing room close to the kitchen and laundry rooms so I can multi-task. 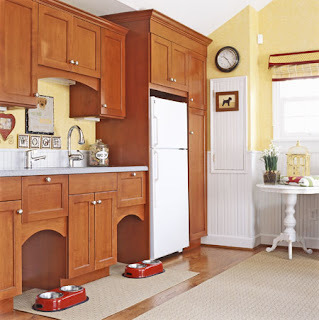 Right now my sewing room is off the den and kitchen with the laundry right across a nearby hallway...my sewing room is the formal dining room of this house. I need to sew more than I need another table to eat at. The first room is awesome! I too have a sewing room and it is my retreat. Not much money to put it together. Went to Costco and bought two folding tables with variable heights - one for the machines and the other as a cutting table (perfect height). Went to Kmart and purchased a bookshelf for all my magazines. Went to Marshall's and bought a pretty cover for the ironing board. 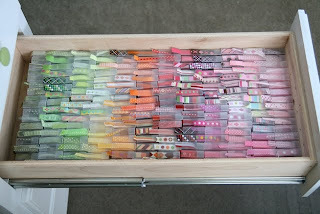 I was lucky enough to have a closet full of shelving for my pattern boxes and fabric stash. Voila - my sewing room! Space is most important b/c I have soooooo much STUFF!!! LOL! I also like to have room to sew and room to spread out! I am very fortunate to have a room in my house dedicated to sewing - it's also kinda spilled over into at least 2 other rooms and that doesn't even count the hand sewing projects that sit next to my chair and ottoman in our TV room! "I would have my sewing room moved in next to my mahogany poster bed before the flowers died. Why would they say that about me?" I laughed out loud over this one & it is only 5 am here! 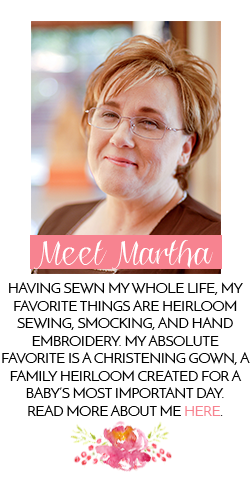 Thanks for starting my day off right, Martha. My most important feature is *good light*! My eyes just get worse & worse with age & I'm now doing handwork with 3.0 readers PLUS an OTT light. Smocking DGD's *Coco* dress with brown on brown twill just about did me in!